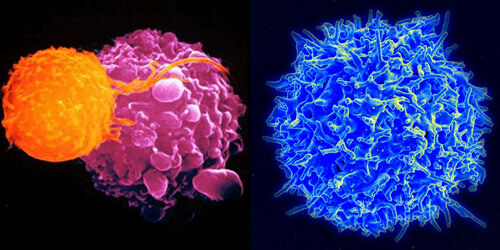 Left: A T-cell (orange) kills a cancer cell (mauve). Right: Scanning electron micrograph of a human T-cell. Memory T-cells respond to fight specific pathogens. A new study from Cornell University demonstrates a way to grow preprogrammed immune cells that can fight specific pathogens, potentially transforming the methods used to prevent infectious disease. Immune cells in newborns appear to be more ready to do battle than previously thought. New Cornell research shows that small populations of preprogrammed immune cells can fight specific pathogens that they have never encountered. The findings, say the researchers, have the potential to revolutionize how and when people are immunized. The study, published in the March issue of the Journal of Immunology, demonstrates a way to grow these cells, potentially transforming our approach to preventing infectious disease. When first exposed to a new pathogen, the immune system takes up to a week to effectively respond, and up to a month to make specialized memory cells that remember how to fight it. The next time a body is exposed, these memory cells take care of it within hours. Scientists had thought memory cells only developed after exposure, but Avery August, professor of microbiology and immunology, and his lab had discovered small pre-existing (innate) populations in 2008. Their defensive potential was unknown until the latest study found they act exactly like memory cells that learn from exposure. Vaccines work by stimulating immune cells to “remember” a pathogen. For example, by exposing the body to a particular strain, a vaccine helps the immune system learn to respond to it. Making memory cells directly could eliminate that learning curve, letting people bypass booster shots and some slower-acting vaccines, August said. People going abroad could get immunizations the day before they travel instead of weeks in advance. Our bodies normally have about 100 memory cells at birth, according to August’s past research, but need about 100,000 to defend against the average invader. Using bone marrow chimeras, a specialized transplantation technique, the researchers were able to make 10 million. The study focused on memory cells designed to attack Listeria monocytogenes, bacteria that cause food poisoning, but August believes the model could be expanded to boost defenses against other infectious diseases. Be the first to comment on "Preprogrammed Immune Cells Can Fight Specific Pathogens"